The American Motorcycle Heritage Foundation released its list of nominees for the AMA Hall of Fame Museum induction class of 2012. 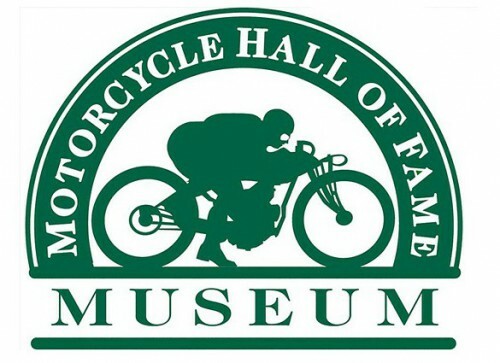 The 26 nominees represents a wide range of contributions to motorcycling, from motocross champions and Daytona 200 winners to tuners to motorcycle rights advocates. The selection committee will further trim the list down to six individuals, three from competition categories and three from non-competition categories. The final selections will be announced over the summer, with the new Hall of Famers getting inducted at a gala Nov. 16 in Las Vegas. Mark Buckner – National/international motorcycling rights advocate, past state coordinator for ABATE of Colorado, past board member/president/chairman of the Motorcycle Riders Foundation. Rod Bush (d. 2005) – Industry leader as former president of KTM North America and member of KTM worldwide board of directors, former member of AMA Board of Directors. Derek “Nobby” Clark – Factory mechanic and tuner for numerous World Grand Prix roadracing championships and Daytona 200 and Imola 200 victories from the 1960-80s. Ty Davis – Multiple championships in AMA Grand National Enduro, AMA National Hare & Hound and Baja 1000, 1990 125cc Supercross champion, multitime ISDE gold medalist and top American. 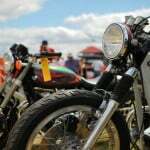 Skip Eaken – Tuner/builder for riders who finished first in dozens of AMA Grand National Dirt Track competitions, crew chief for three AMA Grand National Championships and an AMA Superbike Championship. Jimmy Ellis – First AMA Supercross Series champion and multitime motocross champion. Sue Fish – A pioneer of professional women’s motocross racing in the 1970s and ’80s, multitime Women’s World Champion and two-time Superbowl of Motocross champion. Louis Gerencer – Multitime National Hillclimb champion and past president of the Hillclimbers Association. Charles Gustafson Sr. (d. 1951) – Indian chief engineer who developed the first side-valve engine that debuted in 1916, and is also credited with developing the first kickstarter. Tommy Hays – (d. 1941) The dominant TT rider of the pre-Grand National Championship era who won numerous AMA National Championships in four years. 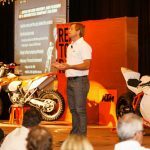 Jack Johnson – Multitime desert racing champion with numerous Baja 1000 wins, silver and gold International Six Days Enduro (ISDE) medalist. Ron Lechien – 1983 AMA Rookie of the Year, 1985 125 Motocross National Champion, multitime USGP winner, numerous outdoor national motocross wins and Supercross wins. Bob Leppan – World’s fastest motorcyclist 1966-1970 who directed the team that set the 2007 land speed record for production motorcycles. John Long – Bonneville Land Speed record holder, five-time U.S. Team member for Anglo-American Match Races, numerous starts in AMA national roadraces and Daytona 200s. Dennis Mahan – Mechanic for numerous dirt-track, motocross and roadracing champions, first U.S. Motocross des Nations team manager, industry racing manager and product specialist. 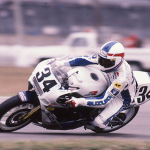 Rob Muzzy – Engine builder/tuner, crew chief, team owner and businessman with numerous AMA roadracing, drag racing, dirt-track and motocross titles and Daytona 200 wins, a World Superbike Championship and a Suzuka 8-hour endurance championship. Don Pink – (d. 1984) Dominant 1940s competitor in numerous disciplines, AMA congressman, founder of the New York State Dealers Association and the NY/NJ Metropolitan Sports Committee. Randy Renfrow – (d. 2002) Multitime AMA National road racing champion, winner of numerous AMA national races, and a consistent winner in 250 GP racing. Jarno Saarinen – (d. 1973) Finnish roadracing world champion and the first European to win the Daytona 200. Brian Slark – England-born motocross organizer in the 1960s, imported/built Rickman, Metisse and Cheney motocrossers and helped establish the Mungenast and Barber motorcycle museums. Rodney Smith – Multiple championships in AMA Grand National Cross Country, AMA National Hare Scrambles and AMA National Reliability Enduro, multitime ISDE gold medalist and top American, third in 1988 FIM 125cc World Motocross Championship. Gloria Struck – North American and European world traveler and motorcycling ambassador, Motor Maids member since 1946. Charlie Vincent – Top 1960s off-road racing competitor in the eastern United States, ISDT gold medalist and AMA congress delegate. Lance Weil – (d. 2006) Roadracer, mechanic, designer, fabricator and businessman, competed in Europe and the Isle of Man, and the founder of Rickey Racer. Al Wilcox (d. 2011) – Life member of the AMA and the Mid-Atlantic Road Racing Club who flagged AMA races for 50 years (and WERA for 30), including 15 years at Daytona. Gene Wirwahn – Credited with building the foundation for the AMA’s government relations advocacy efforts, championed numerous legislative victories and actively promoted responsible riding on behalf of the AMA and the FIM.